NEW YORK (ResourceInvestor.com) -- Matthew R. Simmons says the world is blindly and blithely racing toward an energy crisis rooted in false assumptions about plentiful Saudi Arabian oil reserves. Simmons says that provided "disbelief is suspended", the problem can be dealt with, but not before prices surge to crimp demand. How soon could the crisis manifest? It already has to an extent, but Simmons believes the fourth quarter of this year will see the first real crunch as global demand reaches 86 - 87 million barrels per day, which is 2 - 4 million barrels short of projected supply. He believes that rebalancing the market would require tapping stocks for 180 - 360 million barrels, which simply does not exist. Simmons disagrees with recent analyst reports of oil prices spiking to record highs, because it implies a quick retracement off a high. Rather, he sees prices surging to progressively higher plateaus. Simmons is the principal of the eponymous Simmons & Company International, based in Houston, which consults to a who's-who of the energy industry. 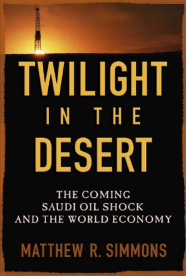 His book, Twilight in the Desert: The Coming Saudi Oil Shock and the World Economy will be available in bookstores from May 27. Speaking with us by telephone, Simmons, who has analysed energy for 34 years, boiled the energy problem down very simply to a failure of conventional wisdom about oil. For example, great store has been placed in new technology that was supposed to find more oil and deliver it cheaper such as 3-D seismic surveys and horizontal drilling. There was also an industry consensus that a supply glut was always impending, whilst there was unrelenting pessimism about a quasi-permanent deflation in natural resource prices. There was also widespread belief that non-OPEC oil producers would emerge to challenge the status quo. Nearly everything has been wrong. Demand has grown massively at 12.5 million barrels a day from 1995 to 2004. The cost of finding new and replacement reserves has increased dramatically, whilst fields recently found have been smaller with lower quantities of poorer quality resource. Technology advances were misleading because they resulted in a form of "high grading" - production was boosted in the short term, but with negative effects in the long term. The primary problem is a lack of information. The most reliable oil producer for 70 years, Saudia Arabia, has been especially secretive about the status of its reserves and output. With energy analysts unable to glean hard information, they relied on reflexively optimistic economists. It has all been wrong, says Simmons. "I took an accidental trip to Saudi Arabia in February 2003," Simmons told us, adding, "and what I saw didn't pass the smell test." He observed technology applications and water handling infrastructure that should have been superfluous to a country reportedly awash with cheap reserves. "We've always been told they had 260 million barrels of reserves in 80 fields... they weren't behaving that way," he said. He was particularly struck by Saudi efforts to rehabilitate old oil fields. "Why were they doing that if they had 80 [untapped] fields?," Simmons asked rhetorically. On his return to the States, Simmons scoured the digitised archive of the Society for Petroleum Engineers. Therein he found 235 technical papers spanning many years which when pieced together presented the actual truth about Saudi oil. Simmons's truth is that Saudi oil diversity and abundance is a myth. For the last four decades, 90% of Saudi Arabia's 8-9 million barrels of oil per day has come from just five giant fields. 85% of the remaining 10% comes from just 3 other fields. By contrast, America produces 5.5 million barrels per day from 800,000 wells. Also, the Simmons found that Saudi fields are highly compartmentalised rather than homogenous, which makes extraction more complex and costly. Those "miracle" fields are now mature and in need of husbanding. In order to keep production rates up, the Saudi fields were pressurized by injecting massive amounts of water. This is not uncommon, but in the Saudi case many injector wells are horizontal rather than vertical according to experts. When the water pressurized oil rises above the level of the injector well, "brine" gushes out, referred to as water cut. It's environmentally messy and usually spells an early end to the primary well. Similarly, there's a point at which the loss of pressure makes a field inert, leaving behind a good deal of oil. Water cut has increased exponentially at Saudi Aramaco's monster Ghawar field. Most worryingly, Simmons says there is plentiful evidence that the state oil company Aramco spent $17-18 billion exploring for new reserves only to come up dry. "They have had no exploration success," Simmons declared, noting also that once publicly available field-by-field data suddenly disappeared in 1982. So why hasn't Saudi Arabia come clean? Simmons says it can be put down to pride and protecting its dominant position within OPEC. OPEC's pecking order is determined by the reserves of its members. It's not just a Saudi problem although that is where the focus is because it was assumed the Middle East provided a perpetual reservoir of cheap oil. However, worldwide there are just 14 fields that provide one fifth of all oil output. The conclusion is that Saudi Arabia has been over producing its most important fields, and has probably been masking capacity constraints by meeting demand from tank farms. With "Peak Oil" rapidly gaining attention outside the industry, Simmons cautions against too simple an interpretation. "It's not a matter of the highest output or running out of oil, but sustainable production," Simmons said. He noted that if his research is correct, and sustainable Saudi production has already passed, then global oil supply has also peaked. The peak oil discovery year was 1965. 2005 is now being marked as peak sustainable production. When asked about Canadian tar sands and South American shales, Simmons said it was critical not to confuse the two types of oil. "They're real and the economics work, but these are high energy intensity projects that can never reach high volumes. They are not a substitute for high flow rate oil. They are not a real offset." It's a gloomy picture and Simmons acknowledges that there are others who argue that reserves are just a function of price. He's adamant and confident that the optimists are wrong, saying, "there's a better chance we'll be living on the moon [than find enough oil to sustain current and projected demand]. Oil will peak and it is not renewable." He is just as bearish on Middle Eastern alternatives such as Russia, the Arctic and Antarctic frontiers, residual North American fields, and Alaska's north shore. They're all speculative projects that he says can only delay peak oil rather than avoid it. Simmons is urging collaboration between the UN, IMF and national energy agencies to create a global inventory report. The intention is to compel companies and governments to give up their production and reserve information field-by-field so that every well bore's productivity can be assessed. "It would take 30 analysts 30 days to sort out what the real proven reserves are," said Simmons. With that data Simmons says we can put the right value on scarce oil, and then start developing ways to balance supply and demand, and recycle petrodollars productively into new forms of energy. The urgent need is to avoid a shock to the global transportation system which consumes 70% of all oil produced. Rail transport. Greenies will try to block new corridor development in the US, but political response to constituents in an oil crisis will prevail. Investments in easements could be worth a fortune, even if those easements are now dormant or alternate use such as rails to trails. Miners could find themselves earning a handy fortune on sidelines like tunnels for expanded networks and shorter routing. The platinum group metal value chain. An oil crisis will accelerate the onset of the hydrogen economy which is seen as reaching critical mass in 2060. That's about ten years after oil supply will decline dramatically according to Simmons's numbers. Hydrogen energy as a mass product is going to consume a lot of PGMs. There will be a huge fortune to be made in PGM recycling. Nuclear supply chain. Nukes are the shortest route to a viable energy alternative for electricity grids. Efficient technologies like pebble bed reactors will be in high demand, but they will also have compete for the uranium feedstock that is in short supply. That's why the price keeps rising and uranium exploration and development plays are such good bets right now. Energy efficiency punts. Investment in structure insulation should soar; think thermal windows etc. There should be rising demand for high efficiency air conditioners, furnaces and water boilers, especially tankless boilers that use lasers to flash heat water. Those consume more metal, especially copper. Coal is enjoying a renaissance, but it's not much good for the transportation network unless steam comes back into vogue. Migration plays. All that snowbird and lifestyle migration may stop short of Arizona and Texas. LPG conversions as a short-term bridge for retail car fleets. LPG-petrol vehicles are in widespread use in places like Australia and that technology could be taken up quickly in the US as an interim measure. Go short gas barbecue grills! Indeed, don't ignore the obvious shorts for which little imagination is needed.